The Fishing Shrimp Truck always seems to be just out reach for lunch, and I had almost given up on ever eating from this truck when I spied it in Midtown on a Wednesday. Fishing Shrimp is usually in Brooklyn, and they stand apart from most other food trucks with their iconic blue truck, and amusing fish and shrimp logo. As far as I know this is the only truck dedicated to fish and chips in New York City. There are three lobster trucks with a variety of shrimp and lobster rolls, but Fishing Shrimp is unique with battered fish and shrimp, conch fritters, and even fish tacos. I decided to try a small shrimp and chips for $8. At first glance it seemed like a pretty small basket of food for $8, but taking into account how costly fresh seafood can be, the proportions were actually very fair. I had five large pieced of fried shrimp, served over a basket full of crispy fries. One of my favorite things about this truck is the four types of condiments they lay out in the front for you to choose from. I’ve always thought that a good sauce can make or break a meal, and it was a tough choice for me between the hot sauce, tartar sauce, cocktail sauce and malt vinegar. First I poured malt vinegar all over the platter, and then dipped the fish and chips in hot sauce and tartar sauce. The breading was light enough on the shrimp that it didn’t overwhelm the flavor at all. 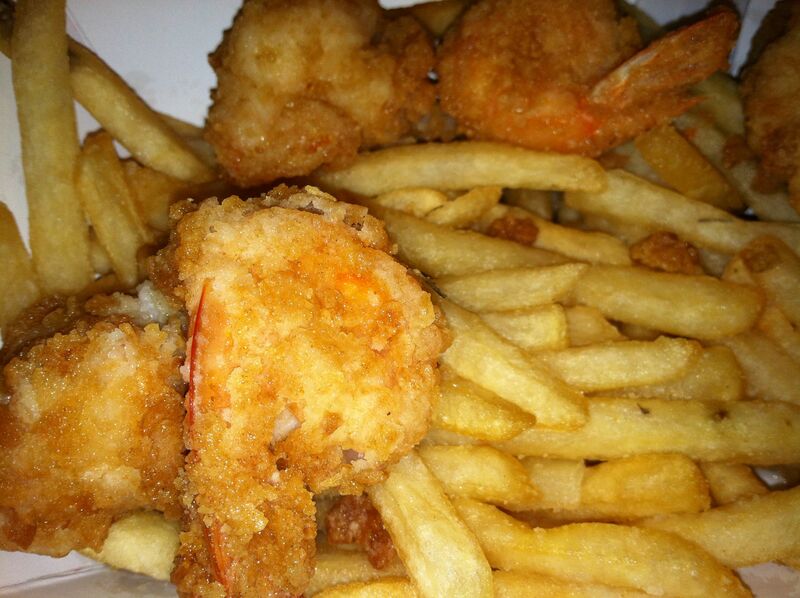 The shrimp was delicious, and surprisingly sweet, which complemented the fries very well. The fries themselves were occasionally soggy, but the vinegar gave them a delicious flavor (I’m a big salt and vinegar potato chip fan). In the end the meal was a very satisfying lunch, and the sauces were a perfect addition to this fried meal. Fishing Shrimp was also much less oily than I expected from a meal that was deep fried. I’ll definitely be eating from Fishing Shrimp again, and I’ve already got my eye on their conch fritters. I’d like to try this truck but I don’t know when or where it will be. Is there somewhere I can go to get this information?